Amir Rezaee had three books which were printed at the same era as Parviz Ghaze Saeed, and by the same publisher, Asia Publishing. 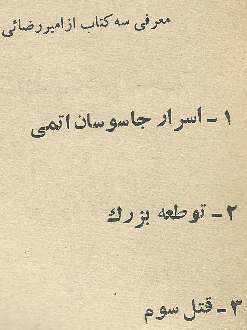 The reason his books are of special interest to PGS fans is because of the fact that he wrote "Ghatle Sevvom" or قتل سوم...featuring Loveson, Samson & Richard. 3 قتل سوم 240 Action Beautiful book from Amir Rezaee, featuring the action trio Loveson, Samson & Richard. Written with a different style than PGS, for better and for worse. It starts with Loveson being invited to a village near Rome in Italy, were he was to visit his friend 'Uncle Alberto'. Soon after his arrival his uncle tells him the intriguing tales of spirits and ghosts appearing at night in an old abandoned castle near by. Loveson gives this castle a stealth visit during the night...but soon after finds himsself in a mountain of problems and asks for help from his two buddies Samson and Richard. Lots of action in this book and it's a must have for Loveson fans.